Remaining homes at NEXUS include a mix of one-bedroom-plus-den, two-bedroom and three-bedroom homes priced from the low $900,000’s. For the sixth straight month, the Seattle metro area posted the fastest-growing house prices in the U.S. in March, according to the S&P/Case-Shiller Home Price Index. Demand is high and inventory is historically low, especially in neighborhoods near urban employment centers. In fact, the cost of single-family housing nearest the city center has set new benchmark prices. In downtown Seattle it’s even tighter, with fewer than 50 resale homes on the market and less than one month’s supply. NEXUS, a new-construction, 382-unit condominium high-rise under construction at 1200 Howell St., underscored the pent-up demand for home ownership when it opened for public sales last month and subsequently sold more than 75 percent of its homes. He says securing a presale at NEXUS requires an initial 5 percent earnest money deposit held in escrow, followed by a 5 percent deposit increase by June 29, 2018 and closing mid-2019. 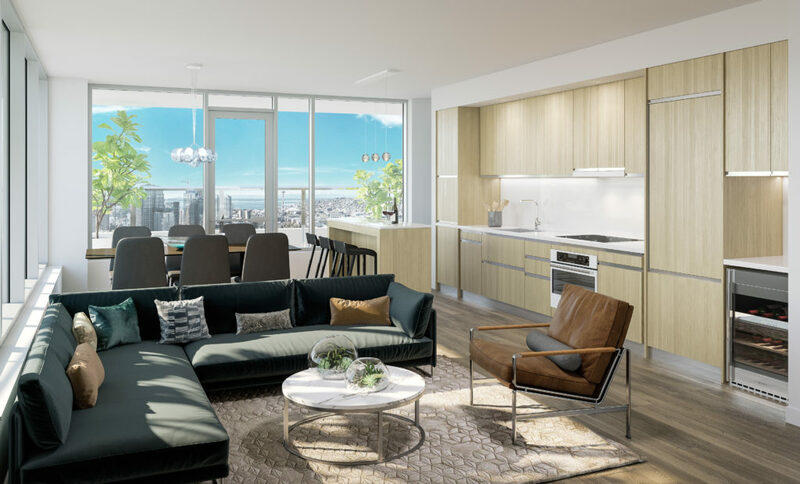 Buyers at NEXUS will enjoy common areas that comprise more than 21,000 square feet and span multiple levels of the tower. A lobby lounge includes a concierge, package storage and access to both a café retail and destination restaurant space that flanks the entry. On the seventh floor, the Podium Club will have co-working spaces, meeting rooms, a media lounge and theater, a wrap-around veranda, a dog lounge with both interior and exterior spaces as well as a dog wash bay, and a fitness center with adjacent indoor/outdoor yoga room and exterior zen space. Above it all is the 41st-floor Sky Lounge, which boasts penthouse-level benefits for all homeowners. Features include a fireside lounge overlooking South Lake Union, an exhibition kitchen, a covered Sky Parlor with firepit, a Sky Garden sundeck, a barbecue area with outdoor seating, a catering kitchen and private dining room, and a games room — all with expansive views of downtown Seattle and the surrounding neighborhoods. According to Dean Jones, president and CEO of Realogics Sotheby’s International Realty, Seattle is experiencing an urban renaissance that is attracting the next generation of homebuyers to downtown living.